Fresh and satisfying with abundant texture and flavor, this entrée salad is easily whipped up for a quick gluten free dinner, yet refined enough to star at a luncheon. Omit the tuna and you have an elegant vegetarian side dish. You’ll need hard-boiled eggs, so cook them in advance. Prepare a bowl of ice water. In a medium skillet over high heat, combine the green beans, 1/3 cup water, and a large pinch of salt. Cover, bring to a boil, and cook until tender-crisp, 3 to 5 minutes, adding more water to the skillet if needed. Transfer the beans to the ice water to cool, then drain. In a bowl, combine the green beans, Great Northern beans, olives, tomatoes, and shallot. In a small bowl, whisk together the thyme, olive oil, lemon juice, and mustard. Season to taste with salt and pepper, then pour about two-thirds of the dressing over the bean salad and gently stir to combine. Adjust the seasonings. Divide the bean salad between 2 plates. Preheat a heavy skillet over medium-high heat. Rub the tuna all over with olive oil and a tablespoon of the vinaigrette. Season with salt and a few grinds of pepper. Sear the tuna for about 3 minutes per side for medium rare. Transfer the tuna to a cutting board and cut into 1/2-inch-thick slices. 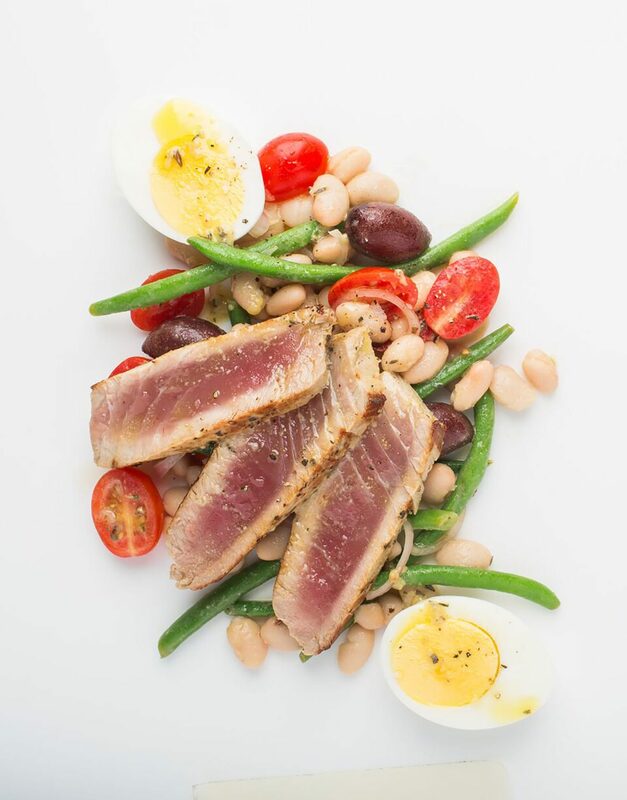 Arrange the tuna slices atop the bean salad. Drizzle with the remaining dressing, garnish with eggs, and serve.